Tofino’s Sobo (Sophisticated Bohemian) started out in 2003 as a purple food truck in the parking lot behind a surf shop. Now it’s a beloved restaurant serving tasty Tex Mex and Southwest inspired dishes made from local, seasonally inspired ingredients and they’ve just released a cookbook! 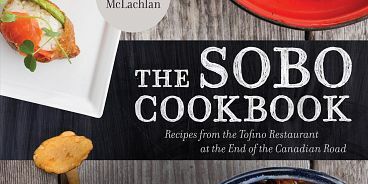 Chef/Owner Lisa Ahier is in the shop tonight to celebrate The Sobo Cookbook: Recipes from the Tofino Restaurant at the End of the Canadian Road. Lisa will read from the book, demonstrate a recipe, and sign everyone’s books. Cost: $45, includes reading, demonstration, refreshments and a personalized copy of The Sobo Cookbook: Recipes from the Tofino Restaurant at the End of the Canadian Road.